We officially have a walker! Sunday morning, as a Father's Day gift, Max started walking! He was walking from room to room, different from the spurts of ten steps or so before that. He's loving it! We were so excited to see it, and the big proud smiles he gives are the best. Tonight he actually walked a full lap around our house (there is a stair case in the center of our house). I couldn't believe it. That wasn't enough though, nope, he wanted more. He crawled right up the stairs! All of the way to the top! A few times he has made it halfway up before getting bored. 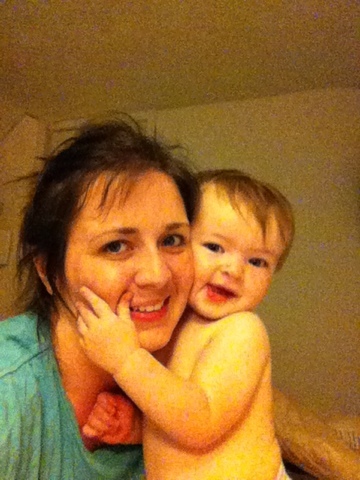 Tonight he went the whole way, and then right into mommy and daddy's room to play. The hugs he's giving are more and more obvious. It's amazing. We brought him in to daycare on his birthday to get a present he had made for daddy, and he ran right up to his friend and gave her a huge hug. They both toppled over in their little embrace, but they were both smiling. I have a feeling that happens a lot with those two! He is always coming up to me for hugs too, and just holding on. I absolutely love it, he's such a lovey baby! Max tried strawberries for the first time this weekend. He was a little confused by the new flavor and texture, but after a few days introducing them, he seems to enjoy them. 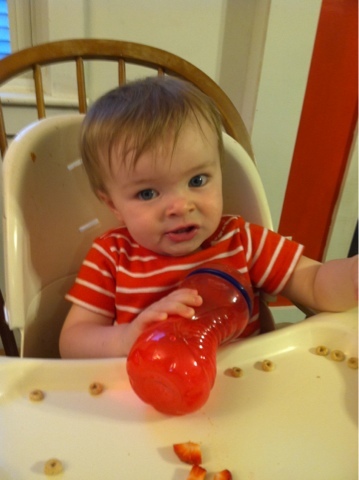 He's also eating yogurt now and loves it! 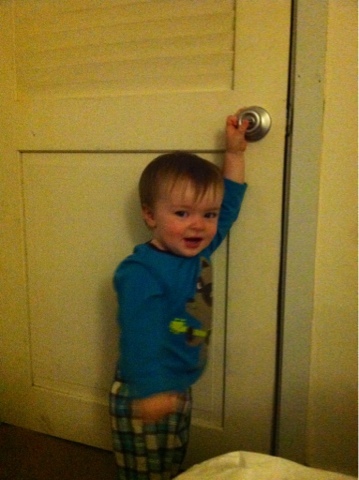 Another crazy thing to worry about, he's trying to turn door knobs! He's been playing with them all week, and apparently he's been opening doors at daycare to get to the push car that he loves. Crazy kid! He's growing up so fast!